Three brief anecdotes illustrate the adjustment to monochronic time orientation in Gringolandia (as opposed to polychronic in Latin America). An expansive response to a thread on the Roosh V Forum criticizing and questioning my article detailing the move back to Gringolandia. Explaining my reasons for moving the family from Lima to St. Louis, Missouri and the implications of repatriation. Explaining why Bad Bunny’s new album X100PRE is not perfect. In fact it’s Not Good, Not Bad, and he should change his name to Sad Bunny. I take to task a poorly educated reader who mischaracterizes several aspects of American culture in a futile attempt to defend Colombian food. On the best image to come out of the Trump presidency: the banquet for college football champions Clemson Tigers. Explaining my typical gringo transformation from seeing “Latino” as a race, which it’s not, to a culture. Inspired by a poem by Noel Quiñones. Let’s Go to Cuba … Before It’s Ruined! A few less-than-ringing endorsements from recent visitors to Cuba, followed by why I’d still like to go (before it’s ruined). Asking some tough questions about the seemingly open-and-shut case of human trafficking in Arequipa which involved Peru’s former top cop, Raul Becerra. Anecdote from a hipster bar in St. Louis and the “blue bubble” which are a bit of culture shock for an expat on a visit home from Latin America. Anecdote from a bank in suburban St. Louis illustrating a bit of culture shock for an expat on a visit home from Latin America. Describing the two extremes when it comes to gringo expats and Latin music, from the Idiot Abroad who doesn’t like anything to the Full Retard who is trying too hard to be liked. Latin America must show it is not impotent in the face of dictatorship in Venezuela. It’s time for South America to clean up its own back yard! 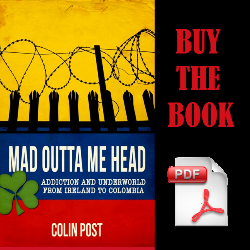 A rebuttal against a Guardian op-ed which argues that white, middle-class cocaine users are complicit in the violence of narcoterrorism and the drug war.